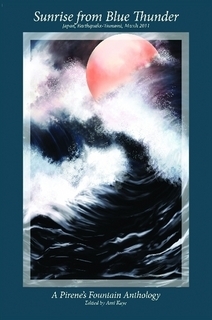 I just purchased and received “Sunrise From Blue Thunder,” the new poetry anthology edited and published by Pirene’s Fountain as a response to the Japan earthquake and tsunami. My poem “What Came After” appears in it. I’m honored to be included in this anthology with so many great poets. Sincere thanks to Katherine Herschler, Ami Kaye and Tracy McQueen, Japan Project editors. Click here to order. Quick and easy via lulu! ← Happy New Year Publication!